In the Eagle Nebula, also known as the M16 located at 6500 light years away and you can see with simple binoculars, we can highlight those dark clumps of gas that is but dust and that shows the creation of stars new. 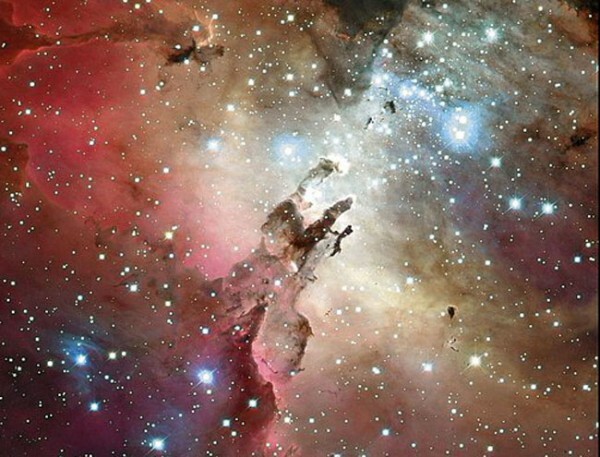 In fact, those stars you see blue stars are newly created, go, young stars and in the “tip” of the pillars very bright areas which is where, by gravity, are condensing dust and creating new observed stars. The bright blue stars are about 5 million years old (our Sun is about 5 billion years) making them newborns. It is, currently, these stars we see blue, now have a similar age our sun. Curious.